Parque Nacional dos Lençóis Maranhenses – Lençóis Maranhenses National Park is part of the Tentative list of Brazil in order to qualify for inclusion in the World Heritage List. I visited this National Park in July 2017. Lençóis means sheets, a reference to the wavy lanscape of the park, a system of little lagoons among sand dunes. I don't know if a landscape like that can be found elsewhere, but for me it seems very unique. It's important to say that many of the lagoons can dry in the second semester, and I can't imagine the beauty of the park without them. 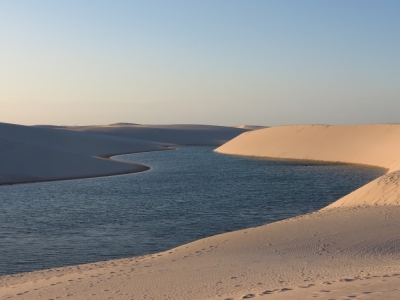 To reach Lençóis Maranhenses first you need to go to Barreirinhas, a small city with hotels and the general support. Most of travellers arrive there from São Luís, the closest city with an international airport, and also with a historic centre listed as heritage site. On my road trip I chose another way, going from Parnaíba city, but that's not the easiest way for a foreigner traveller. Barreirinhas is just ok, not very appealing except for the views of a river there, but restaurants are nice. In the hotel they offered some options of day trips to the park. I went only to the tour of Blue and Emerald lagoons, but there's also a popular tour to the Bonita lagoon, a little more distant. These two lagoons are more famous because of their colors, but there's a countless number of them. Arriving in the park is a little adventurous. The usual way is to go in seats in the back of a pickup truck, not so uncomfortable as it sounds, but it can be a little when the path gets bumpy. The journey begins crossing a river by ferry. I was surprised to see so many people there, the queue of cars was huge and I had to wait a long time until my time to cross. I think it's that way only in the high season. It takes about 40 minutes to reach the dunes. I don't remember where exactly the park begins, because you don't pass by a gate or something like that, but it's interesting to see how the landscape changes and the vegetation decreases. I don't remember seeing any wildlife, but that's not the main point of this national park. Cars can't go into the dunes zone, so then starts the hiking. The guider showed the main lagoons, and then gave a free time for taking a swim - it was just not allowed in Emerald lagoon because of algae problems. I did prefer to use this time to explore more the area. It is breathtaking, and it gets even better when you leave the crowd behind and see yourself alone in this strange desert. Most of the lagoons are very shallow, so no problem to cross them. The tour ends watching the sunset from the top of a dune. Despite my short time there, I really liked the experience. Not just for the beauty of the place, but also the feeling of untouched nature (no paved roads or any kind of buildings). I was very happy to see it as the last addition to the brazilian Tentative List, because it is undoubtedly able to give a good experience to travellers and with a tourist support. I'm not sure if some of latest additions to the list, like Cedro Dam or Itacoatiaras of Ingá River, are able to do so, despite I've never been to these places before.